The heat wave took us to Summer House Café yesterday, where they had just introduced their new summer menu. 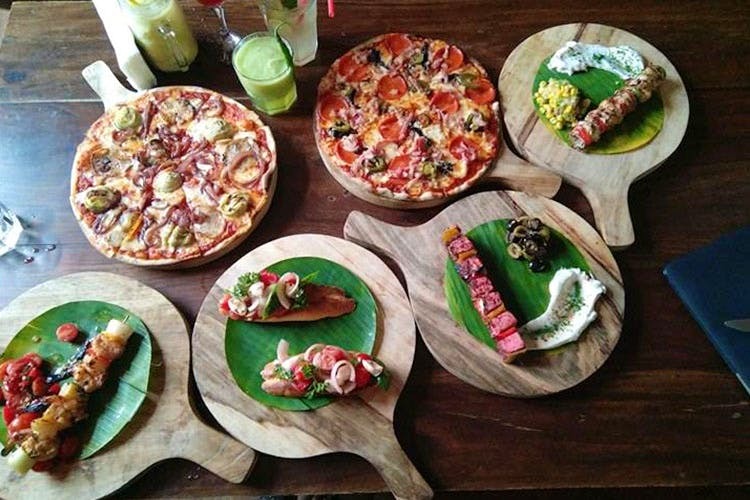 Expect fresh salads, pizzas and mocktails. They have an assorted collection of summer chiller mocktails, crispy green salads and lots of appetisers. The star of the show however, was the pizzas. If you’re almost drained out, dehydrated and famished, their menu could probably perk you up. Salads can be a super satisfying meal in summer, when done right. We tried three salads from their salad bar and we’re in love with the Summer Mango And Dill Salad. The salad had abundance of dill, which went really well with the chicken and freshly cut mango and cucumber. You can’t not try this. Do you often turn to pizza when times are tough? Well, we do and that’s why we ordered two of their best summer fresh pizzas that looked rather enticing on the menu. For meat lovers, the Summeroni Pizza is scrumptious. Beautifully topped with jalapenos and sun-dried tomatoes and bacon. For your vegetarian friends, they have the Artichokes And Potato With Red Wine Glazed Onions. The red wine-soaked onions are chock-full of flavour. We’ve sent back mocktails to the kitchen numerous times because they’re too sweet. Summer House Café has clearly taken customer feedback while thinking up their new menu. Our favourite is the Spicy Indian Limeade. It’s like your regular aam panna but with a twist of green chilli and spice. Order the Sumac marinated Cottage Cheese With Fennel Sauce or their Chilli And Lime Grilled Prawns Skewers to go with your drink of choice. We loved hanging out in the summer sun at Summer House Café, trying out their brand new seasonal menu. If you love your summer food and crave for some variety, you should definitely go brunching with bae or your friends and make a delish afternoon out of it.